The mission of The Salvation Army is to preach the gospel of Jesus Christ and meet human need in His name without discrimination. 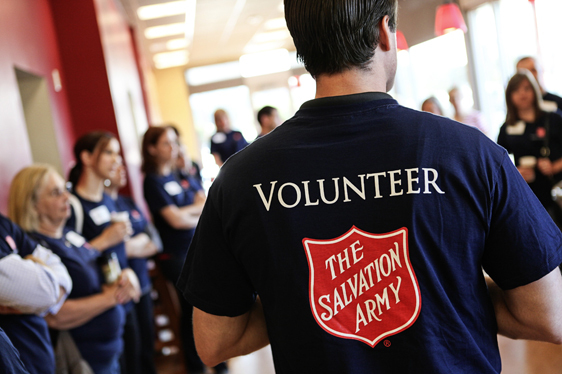 The Salvation Army values and takes very seriously the public trust our organization experiences from donors and civic leaders and it is our goal to maximize every gift for impact in people's lives. Efficiency is a hallmark of Salvation Army service which provides 82 cents of every dollar donated on direct assistance to those in need. The Salvation Army thanks you for your continued support. We depend on caring people like you to help us Transform Lives. We have volunteer opportunities across Massachusetts and work with you to find a time, place and role that works for you. Whether you want to volunteer as an individual every week or you have a church, college or corporate volunteer group looking for a meaningful experience, our volunteer page will help you find the right opportunity. Give with confidence using a credit card on our secure server. Become a fundraiser! Create your own fundraiser to support a cause that's imortant to you, and provide hope to those in need in your community. You may call our Vehicle Donation Program toll free at 1-800-SA-TRUCK (728-7825) to schedule a pickup of your auto or to learn more about the program. To schedule a pickup please call 1-800-SA-TRUCK (728-7825) or contact your nearest Salvation Army Family Thrift Store.